Kara chutney is a delicious & easy chutney recipe that goes very well with idli, dosa, uttapams, medu vada, kuzhi paniyaram, pongal, etc. Also it makes for a good accompaniment with snacks like pakoras, bonda, bajji, etc. 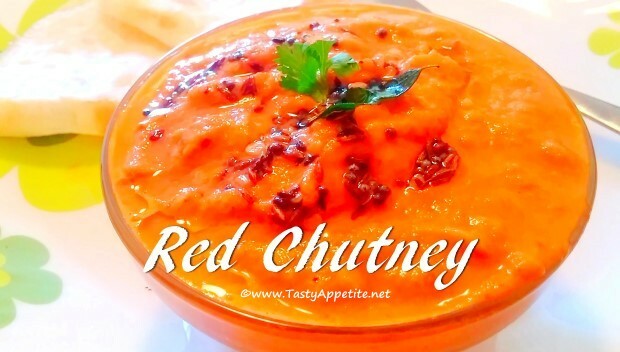 This bright vibrant colored chutney can also be used as a spread for sandwiches. In this video recipe, I will show you how to make this simple healthy chutney recipe! Add red chilli, garlic and toss. Add sliced tomato and small piece of tamarind. Saute until tomatoes are cooked and oil separates. Add the onion tomato mixture to blender. Add saunf pwd and blend to smooth paste by adding little water. Add mustard, cumin, split urad dal, red chilli and curry leaves. Spicy, hot red chutney is ready. It goes perfect with idli, dosa, upma, kichdi, pongal or even as a dip with chats.